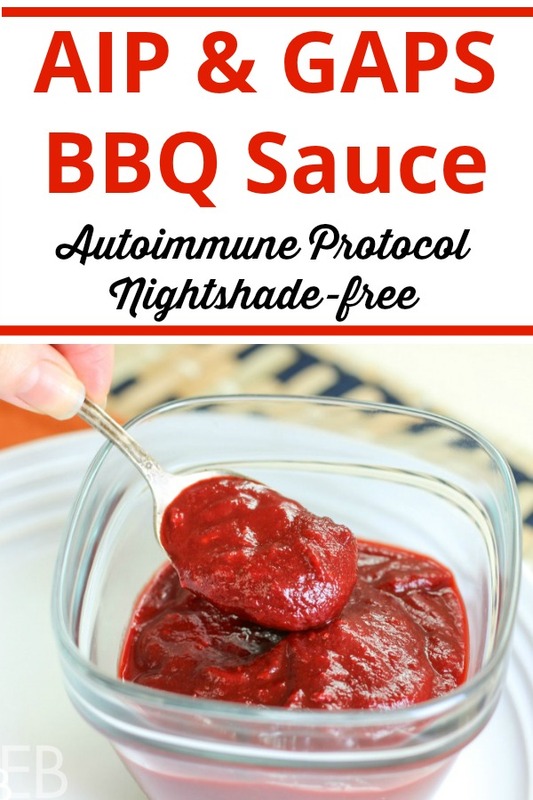 AIP BBQ Sauce is a nightshade-free revelation! And the salad — Satisfying roasted veggies, chlorophyll-vibrant romaine lettuce, cauli rice, probiotic dill pickles and avocado all get blessed with a heaping scoop of homemade BBQ shredded chicken! This salad bowl is Paleo, AIP & GAPS-compliant, with a savory-tart-sweet BBQ sauce that can be used in various ways to make lunches and dinners easy and delicious. Lots of cruciferous veggies, leafy greens, good-fat-avocados, oily seafood, pasture-raised meats and organ meats, the right amount of starchy roots and healthy fats all come together to provide macro and micro nutrients that our bodies use to reverse autoimmunity. Chicken is one meat that we’re directed to not eat too much of, because it is high in omega-6s. Thighs are healthier than breasts in this respect, which is why I prefer them (but I also prefer their taste and texture). If you’ve reached your unofficial chicken quota for the week 😉 you can certainly make this recipe, too, with leftover slow-cooked pork or beef. The BBQ sauce is scrumptious used in various ways and with various meats, and yes, it’s nutrient dense, full of fiber for increasing one’s microbiome diversity. The main theme of this dish, though, is that it’s healthy AND delicious — sure to satisfy and nourish — and leave you feeling good inside and out! For GAPS, there are just a couple of small variations to follow in the recipe below. How wonderful to have a big, gentle, delicious! salad while on the GAPS diet. It really changes things up, offering variety, fun and excitement for dinner! This salad bowl features roasted sweet potatoes (with GAPS variation) and yellow beets. These two sweethearts provide rich complex carbs and excellent fiber. (Beets are terrific if you struggle at all with having regular bowel movements. I think they’re great to eat everyday if you have this struggle!) Nearby in your dish, enjoy that ubiquitous cruciferous side: cauli rice. Both can be garnished with that FAB BBQ sauce we’re getting to, or a drizzle of balsamic! (although not for GAPS). Then romaine (known to be disease-fighting, anti-aging, energy-enhancing, and immune-boosting! ), avocados and probiotic dill pickles (do you already eat these regularly?? If not, I think you should; they’re SO good! Or learn more about making your own here). Wow, right? : Like we talked about above, everything is nutrient dense AND delicious, just like Paleo, AIP and GAPS can and should be. Lastly, the focus of this recipe: I’ve created an AIP compliant BBQ sauce that’s fun and delicious! If you ever want to speed up the recipe, although it’s already pretty fast and easy, you can even use leftover Nomato Sauce as the base! (Here’s my Instant Pot Nomato Sauce, and here’s my stove top Nomato Sauce recipe, if you’d like to use them.) At least in our home, we often keep it on hand (one of my favorite foods!). I give that variation below. 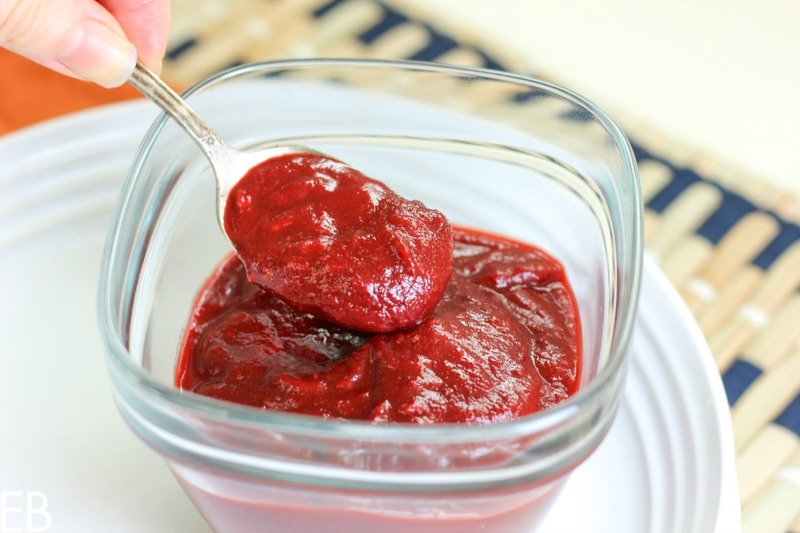 This Paleo, AIP and GAPS BBQ sauce is high in fiber, super tangy, a little sweet and refreshingly different than what we eat other days of the week, a welcome and zippy change! 🙂 Plus, it’s comfort food that most folks can’t help but like! If you enjoy the convenience of meal planning and batch cooking, you can prep the veggies that get roasted a day or two ahead. You can cook the chicken up to several days ahead, or use leftover chicken. And you can make the BBQ sauce up to 5 days ahead. 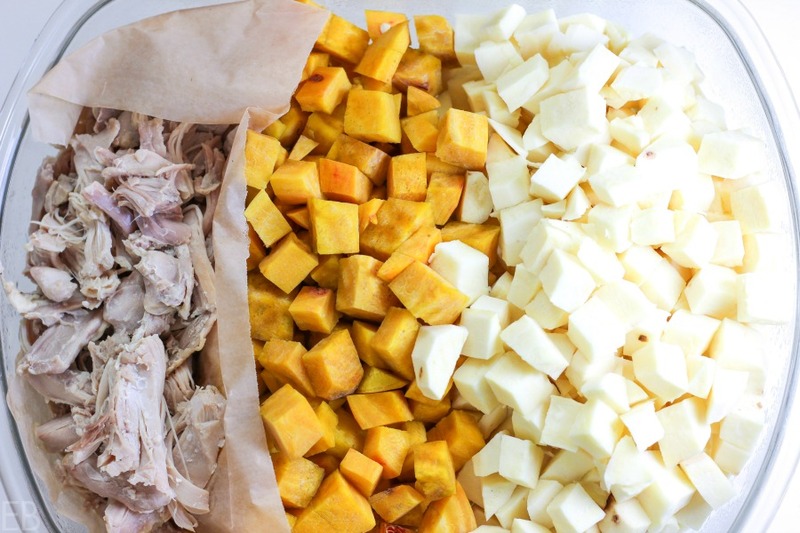 See the photo above of my shredded chicken, cubed yellow beets and cubed sweet potatoes, which I prepped the day before — which makes this dinner come together very quickly and with ease. Variations — You can make this dish just a bowl or just a salad if you like. Easily leave off the lettuce and serve everything hot for a nourishing, warming bowl. 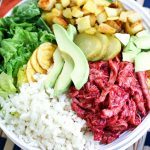 Or, in warmer months, pile the lettuce underneath and emphasize the salad with all the cold toppings: the BBQ chicken salad can be served cold, with lots of avocado, dill pickle slices, and cold cooked beets fanned to one side. Preheat oven to 425 degrees Fahrenheit. Place sweet potatoes and cauliflower in large mixing bowl. Add olive oil, garlic and sea salt, stirring to coat. Spread veggies out onto one to two shallow baking pans, depending on their size. Roast until sweet potatoes are fork-tender, about 30-35 minutes; stir and turn over vegetables occasionally during cooking so dark bottoms get flipped. Drizzle with optional balsamic vinegar and keep warm in oven at lowest temperature until ready to serve. Place chicken in medium-size bowl and shred using two forks. Add 1-1/2 cups BBQ sauce and lightly stir to coat. Use remaining BBQ Sauce to drizzle over bowls. 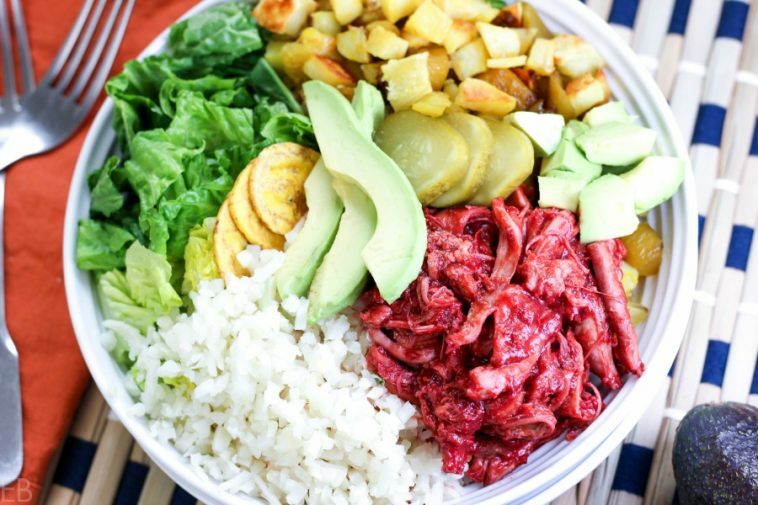 Assembly of BBQ Chicken Salad Bowls~ Place each ingredient in serving bowls separately, side-by-side, to create a composed salad bowl: romaine lettuce, roasted veggies with any pan drippings, cauli rice, BBQ shredded chicken, chopped avocado; garnish with probiotic dill pickles and/or plantain chips. Place carrots, beets and onion in steamer basket over boiling water. Cover and cook until very tender, about 15 minutes. Place steamed veggies in high powered blender with the remaining ingredients (OR if using the Nomato Sauce option, use 2 cups Nomato Sauce in place of the steamed veggies and bone broth): bone broth (omit if using Nomato Sauce shortcut), apple cider vinegar, optional bacon fat, maple syrup, coconut amino acids, fresh ginger and garlic, sea salt and optional fish sauce and molasses. Blend on lowest speed, and increase as motor moves with ease. Blend on medium to medium-high speed for about 45 seconds until sauce is smooth. You can also smother chicken pieces with this BBQ Sauce before baking, delicious! You mention that chicken should not be eaten that often because of the omega 6. I have been vegetarian for a while but recently had to start eating meat again because of the health issues that a vegetarian diet was causing me. But I am still confused as to how much meat and of which types I should be eating. How often should one eat chicken? Thank you! This recipe looks amazing. I’m new to the AIP diet but had to start practicing it because of digestive issues. So glad there are still such amazing recipes out there. Hi Sabrina, thank you and great questions. I can’t give you an absolute on how much meat to eat weekly/daily, because our bodies are unique, and it varies person to person. But I’ll use myself as an example, if that’s helpful. We eat chicken about once a week. I find I need a lot less meat than my sons, but I still eat meat daily, at least once, sometimes 2-3 times daily, 2-4 ounces each time, including seafood and eggs. 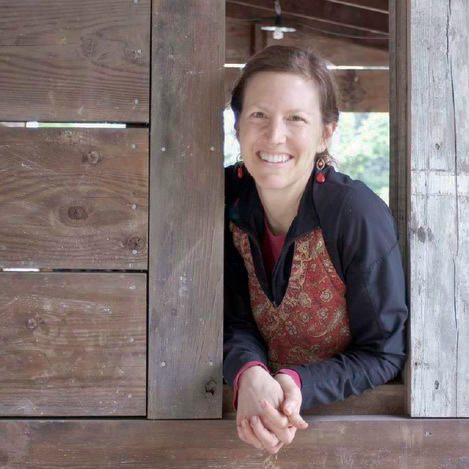 I’m 45 and was a vegetarian, too, for 10 years. I had to start eating meat again with my pregnancies and learned of its importance during that time. Pasture-raised meats are the best, and that’s the key when buying, for the meat to be truly healthy: pasture-raised pork, lamb, beef, buffalo, turkey and chicken, as well as wild game. Dark meats tend to be best. When you see meat labeled “grass-fed”, it’s not always accurate to what we’re hoping for: Sometimes the farmers are using a lot of pesticides on that grass. So ideally we look for sustainable local farms so we know the meat’s being raised on sustainable grass and the animals are being cared for. Over the years I’ve learned to listen to and read my body, which is how I’ve determined what to eat when and how much. For example, I tend to emphasize protein and complex carbs at breakfast, a light lunch and a big salad at dinner. I’m excited for your AIP journey and wellness process!! Blessings!! Oh yum! What a great combination of flavors. That BBQ sauce looks sooo delicious. Your BBQ sauce is beautiful and sounds do delish!! SO darn creative! Love colorful bowls like that! I’m not AIP but I still want that BBQ sauce. Love everything about that salad and thanks so much for the make ahead instructions and tips as I can see this being a regular lunch meal but would need to do some prep ahead of time. This is a bowl of goodness! Thank you for sharing. That BBQ sauce with carrots and beets sounds amazing! Sweet potato and yellow beets?? That combination sounds heavenly! Making this ASAP! This looks so delicious! I love the beet color. Love a yummy and filling salad like this one! The colors are so gorgeous too. Hi and yes, you can omit it. You can also replace it with 1 teaspoon of traditional miso paste (if you tolerate fermented soy) or an extra teaspoon of coconut amino acids. Thanks for the question. Oooo yes, love this salad. This is going to be a go to for me! ooo what a FUN BBQ sauce – we aren’t AIP but I love the ingredients! Definitely trying this fun salad! Everything in the bowl is so delicious and I love it’s AIP friendly, too! Amazing! Yum, what a delicious way to combine nutritious ingredients! I’ll be using your recipe for BBQ sauce for sure since my son can’t eat tomatoes. He’ll be excited! These bowls looks incredible, and your BBQ sauce is a must try! This looks like a great bowl of nourishing goodness! I love colourful healthy bowls of food like this, they are perfect for lunch or dinner. Will be adding this to the menu this week! I like that BBQ sauce recipe! Would make a tasty lunch! What a delicious looking salad bowl! I can’t wait to add it to our warm weather salad rotation! Fantastic salad that I can’t wait to try! I am so excited that it is Paleo and AIP. not to say that I am crazy about BBQ sauce! Delicious!